Google looks to recruit Ethereum founder for possible cryptocurrency project. Vitalik Buterin, the founder of Ethereum, has been approached by Google in order to help the technology giant with its upcoming blockchain project. 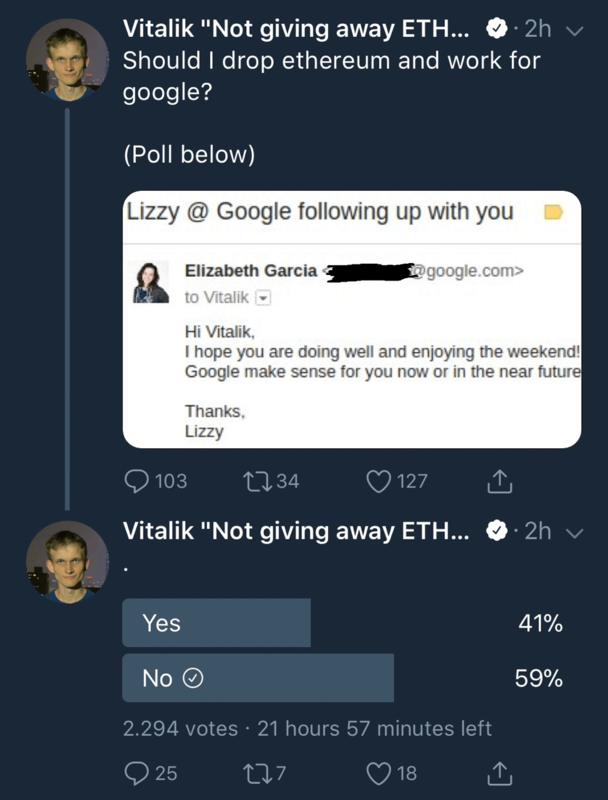 In an email screenshot shared by Vitalik on Twitter, Elizabeth Garcia, a recruiter for Google, is appearing to offer him a job. Elizabeth Garcia is an engineering recruiter for Google and there is no doubt that this email came from the tech giant. Google is at at odds with several companies that have chosen to pursue blockchain technology. The tech giant appears to be late to the party. A number of Google employee’s have left the company to go out and set up their own blockchain companies.